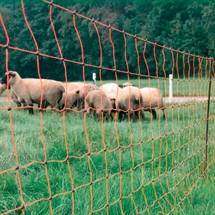 Portable netting ideal for temporary containment of sheep. 50m Roll 900mm high. Complete with 15 posts with single steel spikes for most ground conditions. Multiple nets are easily connected. Heavy-duty poly wire has 3 x .2mm stainless steel conductors per horizontal fence line. Includes repair kit and corner post tie downs. Not recommended for use with horned animals.